Megadyne offers a complete line of Rubber Power Transmission Belts used in a wide variety of industries and applications ranging from small appliances to large industrial equipment. Regardless of your power transmission needs, we have a product in our comprehensive range of belting that will suit your needs. 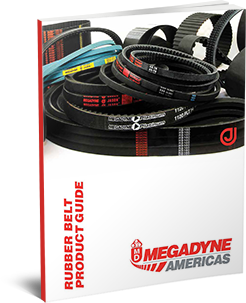 Fill out the form on the right to access the Rubber Belts Product Guide.